The logo design has been revealed for the Olympic Games in Rio De Janeiro 2016. The design was selected from numerous submitted ideas across Brazil. Rio design firm Tátil were successful and won this selection process. The logo design takes the form of three people in loose shape holding hands. Are they dancing or playing? Or maybe they are just holding hands? The logo supersedes the now famous London 2012 Olympic Logo and it has been compared to a number of logos and paintings already. 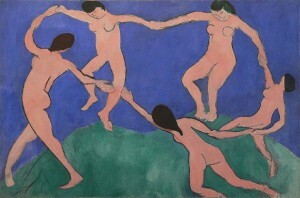 One such work by artist Henri Matisse, is “The Dance,” a wonderful energetic painting created in 1909.